The Butler, a proposed condo tower for suburban Oak Brook, will blend into the surrounding community, say the designers. CHICAGO—After undergoing a resounding crash more than a decade ago, condo development has just started a cautious comeback in the city of Chicago. And the region’s affluent suburbs may soon see similar moves. A group of developers and architects recently put forward a plan for a 22-story luxury condo development in Oak Brook called The Butler. 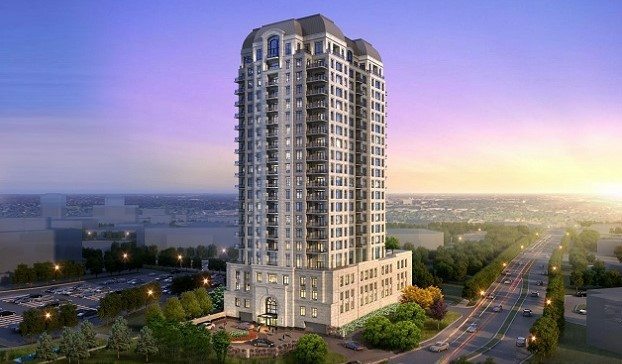 At a time when many developers focus on the deconversion of condo buildings back into rental apartments, both in the city and surrounding suburbs, others calculate the time has finally come help empty nesters stay in the suburbs and maintain the level of luxury they’re accustomed to as homeowners. “A condo is a home, not an apartment,” says Lucien Lagrange, the Chicago-based studio’s head. And for retirees who may travel to FL or other Sun Belt states during the winter, having a condo brings a peace of mind difficult to maintain when leaving a house empty for months. And as the US population ages, the demand for such homes should keep growing. The team, including Chicago-based Jupiter Realty Co., LLC, one of the developers, presented their proposal to the municipality last month. If approved, the building at 1900 Spring Rd. will feature 90 condo units, including 88 units between 1,340–3,500 square feet and two penthouse units between 5,000–5,400 square feet. In addition to high-end in-unit amenities, community-wide spaces will include a curated library, wellness spa, infinity pool, rooftop terrace and communal gardens. Lagrange is known for the designs of several luxury developments in Chicago, including Park Tower, 65 East Goethe, the Waldorf Astoria, and the Ritz Carlton Residences. In addition, ground was broken earlier this spring on the firm’s 8000 North, a 12-story, mixed-use retail and residential building in downtown Skokie. My-Nga Lam emphasizes that the Oak Brook residences will blend into the community. Bikers and pedestrians on a nearby path, for example, will ride or walk past a gated courtyard. Unlike commercial towers, the façade will seem more home-like, with different-sized windows for bedrooms and living rooms. In addition, an elegant roof will conceal the building’s mechanical equipment.